Another holiday weekend in the United States and another giant blockbuster. Ho-hum. Families will have no end of choice this weekend, as all three new releases appeal in some way to familial bonding. One film stands out beyond the pack and the people behind it have the most to gain or lose from this weekend's proceedings. Traditionally one of the biggest weekends of the year, the July 4th weekend will have nothing to disprove it this time. After the one-two punch of Independence Day and Men in Black, Will Smith was thought nearly invincible at the box office. However, as the adage goes, you're only as good as your next film. Enemy of the State was a modest hit but expensive; a $90 million budget makes judging the profitability of this one a dicey affair. Then the bottom dropped out; Wild Wild West was a financial disaster, grossing just $217 million worldwide ($114 domestic) against a $170 million budget (taking into account a theater's cut, advertising and actor's points, this was a huge hit for WB). More disturbingly, this was a re-teaming with Men in Black director Barry Sonnenfeld. Something had gone very, very wrong. The Legend of Bagger Vance followed, and this teaming with Matt Damon raised only $30 million off a $60 million budget. Ali was obviously a personal success for Will, as it was the best performance of his career and netted him an Oscar nomination. However, after a hot $10 million opening-day start, the film fizzled badly, ending under $60 million domestic against a reported $107 million budget. Will Smith presents an unusual case; with three - and possibly four - big money-losers in a row, he's an A-List superstar who hasn't earned his paycheck (in movies at least) in five years. No wonder, then, that he'd return to a sure-fire hit franchise like Men in Black, a third teaming with Barry Sonnenfeld (which would have been four, had Barry gotten to direct Ali as he'd planned). Sonnenfeld needs the help too, as the ex-Coen Brothers cinematographer had all his post-Men in Black projects fail; two noble TV efforts and a crime comedy that was the victim of bad timing and poor casting. Both Maximum Bob and The Tick were short-lived series that never really got the support of their networks. Big Trouble got caught in post-9/11 sensitivity about its plot (which involved both a hijacking and a nuclear bomb) and a lead actor on a decline. So this film is as much for his benefit as it is Will's, not to mention Tommy Lee Jones, except that he's actually been successful in the meantime. With a relatively modest $97 million reported budget, Smith and Sonnenfeld would appear to be safe from losing anyone any more money. 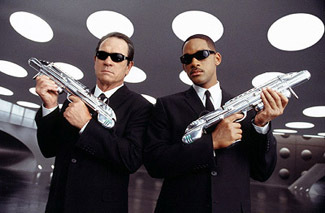 In a similar time frame as this sequel's five-day opening weekend, Men in Black made $84.1 million. The ads for this edition, if anything, look better than the original's (aside from Will's embarrassing little "rap language"), brilliantly incorporating the attitude of the original with the role reversal this time around between Smith and Jones. This is exactly the kind of film that could challenge the recently-won weekend title of Spider-Man, especially with its ultra-short 88 minute (including credits!) run, time allowing for more screenings. Ultimately, Men in Black II will fall short, still earning a massive $88 million ($1 million per minute) for the three-day weekend and $120 million for its five-day holiday weekend. Two family films challenge for the other dollars this weekend, although both may be less restricted to that narrow term than might be thought. Like Mike appears to have the edge over The Powerpuff Girls based on promotion and theme, although neither should suffer. Like Mike aims more squarely at the 10-15 set, with its fantasy portrayal of a kid who finds magic sneakers with the initials MJ that somehow enable him to compete at the NBA level. So, it's just Rookie of the Year in basketball, right? Well, it is and it isn't. Lil' Bow Wow lends it instant credibility; young movie stars are rare for no shortage of good reasons, so it's only natural to look to music, where they seem to be on sale in bulk lately. Secondly, there are real NBA stars, although the main players are actors. While I hate the trailer, it plays extremely well to its strengths, that of the game footage plus the magic realism of finding the magic sneakers. The less said of the players' acting, the better (I feel especially sorry for Dirk Nowitski and Jason Kidd; Ray Lewis has experience, why not get him?). With just the right loopy sensibility, this could be a minor success, even going up against the juggernaut of Men in Black II. I predict about $20 million for the entire five-day period, with $14-15 of it happening on the weekend proper. Blossom, Bubbles and Buttercup make up the extraordinarily popular Powerpuff Girls, The Cartoon Network's flagship show. It's become the latest cable network to try its hand at turning loyal viewers into paying customers with an extended version of the show on the big screen (at 87 minutes, it's only one minute shorter that the supposedly more mature Men in Black II). Its main challenge will be to convince people that it's not just for kids, even though the PG rating (which is for what might be my new favorite MPAA rating decision, "frenetic non-stop animated action") and the cutesy name (however appropriate) will take a lot to overcome. Wickedly subversive and empowering at the same time, it brings similar qualities to bear as South Park's or Beavis and Butthead's forays into film. That's not a recipe for a box-office champ; however, with a small budget like this one's $25 million, profit is near guaranteed. A five-day take of $15 million should be sufficient to build towards this, with about $10 million of it coming from Friday-to-Sunday. Mr. Deeds was a successful return to form for Adam Sandler, with $37 million being just about the right amount to signify forgiveness by his fans. His previous big hits have shown a remarkable resiliency, despite their self-limiting audiences. The Waterboy and Big Daddy both fell less than 40% in their second weekends, and I see no evidence that this film should behave differently. Part of the reason Big Daddy may have performed so well was its placement just before July 4th weekend, as well as the fortuitous arrangement of the 4th in relation to that year's weekend. Individual day performance around July 4th can be as complicated and convoluted as a David Lynch film, meaning that no year is ever really the same. With the holiday falling in the mid-week this time, it should behave close to a "normal" weekend. In that case, about $23 million makes sense for this film's second weekend. The Minority Report vs. Lilo & Stitch story continues to rage, with Disney winning mid-week and DreamWorks taking the weekends. Separated by only $75,000 last weekend, the net effect has Lilo & Stitch on top overall. Nearly identical drops are unlikely to continue for two straight weeks for these films, so there has to be a horse that pulls ahead in this race. I give the edge to Lilo & Stitch, which, even with three competitors for family dollars, still has the Disney pedigree. It'll still be close, though, with both taking about $14 million and L&S getting the position by maybe $300,000 or so. Star Wars and Spider-Man are back in news territory, even as both slip out of the top ten. Milestones of a sort are possible for both this weekend. Spider-Man may just tag the $400 million mark this weekend, though it'll need help from July 4th to do it. Combine the holiday with a continued slight drop (it's had just one weekend over 40%) and it will tie Titanic for taking 66 days to reach that tally. Attack of the Clones is also set to pass the current lowest-grossing member of the trilogy, The Empire Strikes Back. Sitting at $290 million, with the same help from the weekend, it'll mark a record of its own.